If you want a VPN for your Internet Explorer web browser, Windows Report has compiled the best VPNs for you. Internet Explorer is the default browser found in all windows operating system, although it is usually derided in favour of other popular browsers like Google Chrome and Mozilla Firefox, it is still being used as a secondary browser. While using the full VPN service gives numerous benefits with connections being encrypted, secure IP address and access to different websites. It also comes with some downsides; use of VPN usually slows down your internet speed and may conflict with some programs and applications in your system. Full-scale VPNs usually come with a lot of cost and side cost which may be expensive for an average user. However, their benefits include full encryption of connection with the hiding of browser IP address and kill switch options. If you want to spoof your location online while surfing the web through IE from anywhere in the world, then CyberGhost is the best VPN for Internet Explorer. This VPN replaces your IP address with any available IP address from the CyberGhost network, hence, your online activity cannot be tracked. In addition, when you try to access a website, CyberGhost runs a thorough check on the URL in a dedicated database, to ensure if the website is safe. 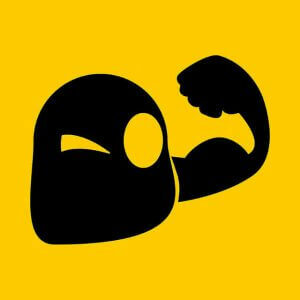 Furthermore, you can download CyberGhost for free and use it in trial mode for 7 days. Hotspot Shield is a well-known VPN service provider. Also, this VPN service provider has browser extension for Internet Explorer and Chrome which can be downloaded for free. In addition, Hotspot Shield doesn’t mandate users to input their email address or personal information which is cool. Meanwhile, the extension is easy to use with a simple click which connects you to the fastest server for your location. 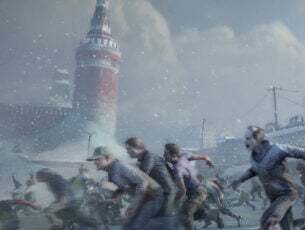 The free plan doesn’t include US and UK servers but you can access France, Germany, India, Netherlands and Spanish servers. Hotspot Shield range of location server and easy to use interface makes it a worthy choice to use as your internet explorer VPN extension. Although its free to use you can upgrade to the elite plan which removes ads and gives more functionality. Users can also pay $120 for lifetime usage. Express VPN is known for their top-notch VPN service and excellent VPN software client. The VPN has cool features such as a kill switch, and a DNS leak prevention tool which takes care of IPv6 leaks. The VPN client software also has an easy user interface. In addition, ExpressVPN extension can hide your true location from websites that use HTML5 geolocation, government trackers, and your internet service provider. You can access over 1400 servers in 94 countries. ExpressVPN upholds a no logging user activity. Their servers are encrypted with 256-bit encryption technology. 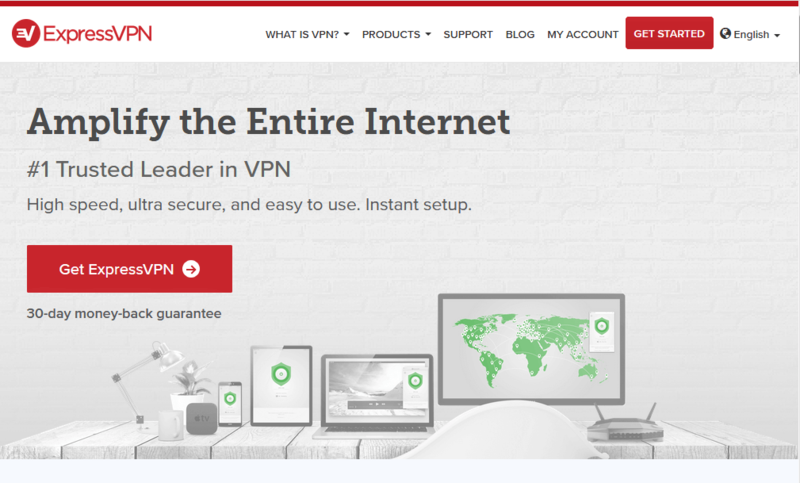 ExpressVPN offers a 30day money back guarantee which allows you to test run these features. ZenMate is the most widely used VPN service in Germany. The German-based VPN provider has over 35million users. ZenMate give ads filled basic functionality for free, but uniquely there are no data transfer limits and you have access to just four server locations. 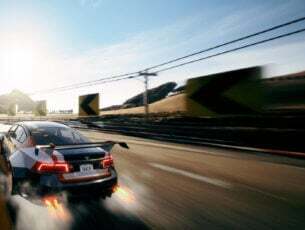 The VPN is easy to use with users selecting desired locations from the drop-down list and connection is attained immediately. The address bar icon updates to show connection status. ZenMate gives good internet speed with each of the four free server locations giving adequate speed levels on testing. Upgrading to the full VPN client gives you more features and better performance with more than 35 locations available. The full version also allows compatibility with other applications on your PC and comes with malware detection. ZenMate full version is priced at $5 a month which is paid annually. 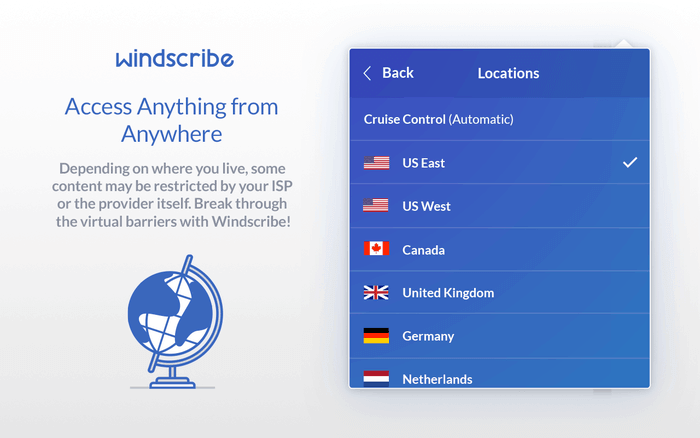 When it comes to free browser-based VPN extensions, Windscribe is arguably the best with fewer limits and excellent features. Windscribe gives you 2 GB of data limit a month for free for just choosing a username. Although email registration is not compulsory you get a massive 10 GB of free data allowance if you register your email. Windscribe has a unique feature called cruise control which chooses automatically the fastest server for you, what makes it different from other rivals is on hitting a blocked resource or website it changes the server to enable you to bypass these blocks which is cool. 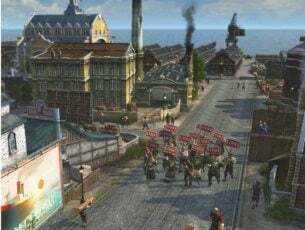 You can also manually choose your desired server locations which options available which include France, Germany, Luxembourg, Netherlands, Hong Kong US Central, US East, US West, Canada East, Canada West, and the UK. Each of the servers provides good browsing and downloads speeds for testing. Meanwhile, after upgrading to the premium plan you get unlimited bandwidth and access to 50 server locations. The premium plan costs $4.20 per month which is billed annually. 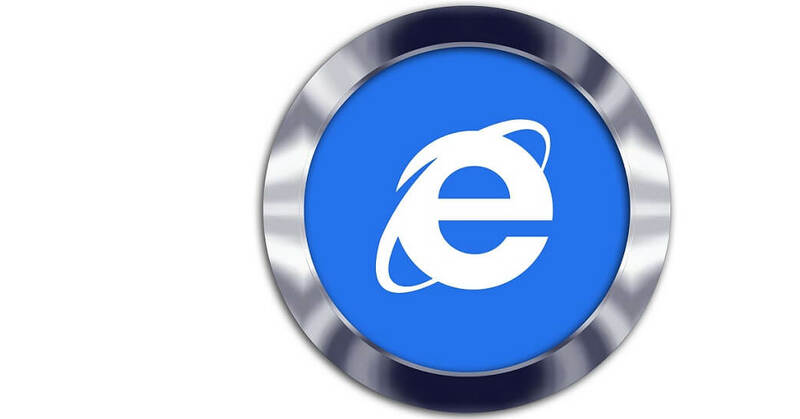 Have you used any of the best VPN for Internet Explorer we mentioned above? We’d really recommend you check out these VPNs. Share with us which one you use or have tried before with IE, by leaving a comment in the section below.